The committee, which included Richard Brill, Ryan Carnegie, Allison Colden, Jerome Maa, and Kam Tang, evaluated 15 papers in both the Ph.D. and Master’s categories. 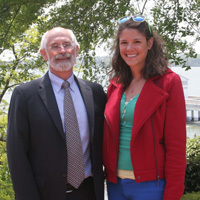 This year’s choice for the best paper by a Master’s student goes to Sarah Sumoski for “Biotic Dispersal in eelgrass Zostera marina.” Her paper appeared in Marine Ecology Progress Series and was co-authored by Robert Orth. Sarah’s paper was chosen for the featured articled in their December issue and was published just 6 months after she formally graduated from VIMS. Sarah is currently working as a research scientist in Dr. Orth’s lab. She was one of the first people to address the role that vertebrates play in dispersing seagrass seeds, a process well known among land plants, yet almost completely unknown in seagrasses. She conclusively proved after 3 years of painstaking feeding trials that an eelgrass seed can make it through the gut of different animal species, and germinate. She also determined that these animals could transport seeds as far as currents carry flowering shoots with seeds. This research will be highly cited in future years given the importance of seed dispersal in maintaining or establishing viable populations of seagrasses. 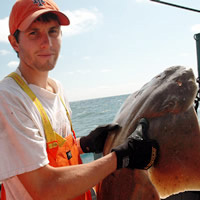 The most meritorious student author in the PhD category is Patrick Lynch for his paper “Performance of methods used to estimate indices of abundance for highly migratory species.” This paper appeared in Fisheries Research and was co-authored by Kyle Shertzer and Rob Latour. The accuracy of stock assessments used to evaluate the status of highly migratory fishes depends, in part, on developing indices of relative abundance. Two competing approaches have historically been used for this purpose, and the literature is rich with the pros and cons of each approach. As an attempt to bring some closure to the controversy, Patrick evaluated the performance of both methods, along with a new hybrid approach he developed independently. The results of Patrick’s study showed that his hybrid approach convincingly outperformed both of the other methods, and we are hopeful that Patrick’s approach will be adopted by U.S. and international scientists working on assessments of highly migratory species.